I finished up my RLE (Run-Length Encoded) image renderer last night. It would have been much simpler but there were a few things that I wanted to deal with to have proper full support for sprite placement and large image rendering. Which leaves $01 through $0E, which we will use as a "skip". Advance the screen position, but do not draw any pixels to the screen. We can use this to allow images to have "transparency". inc IMGPTR    ; will wrap around inside a bank. bad. I instead had to add a '1' to it, then add the carry bit onto the high byte of the value. I need to take a step back here. The 6502 only really has grasp of 8 bit (one byte) values. It can use 16 bit values for addresses, stored as two bytes, but all math functions happen on the one-byte scale. Why use RLE? A couple reasons. First of all, it will save ROM space. The RLE encoded (compressed) images should take a bit less space inside the rom. An alternate we could do is to store color data in both nibbles of the byte, then just shift them out to the screen. We would lose the ability for transparency, but you're guaranteed 50% space savings with the system we have here. The full source code for this project is over at github. The image shown at the top of this post shows three sprites stored in the ROM. They were hand-encoded from graph paper sketches of various sources. The rainbow was just coded by scratch to test out everything. 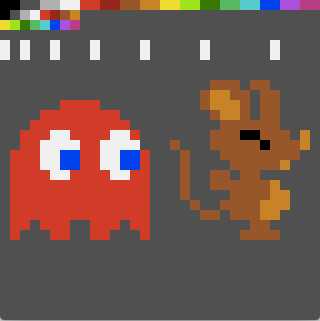 The red ghost is obviously borrowed from Namco's "Pac-Man" arcade game. The mouse is borrowed from Nintendo's "Goonies" arcade game. Both are used for educational/demonstrative purposes here.